Dateline 1981 — what a fantastic year of new releases for me… Let’s see, Van Halen with Fair Warning, AC/DC with For Those About To Rock, Judas Priest with Point Of Entry, Rush with Moving Pictures. 1981 was the year also I got Def Leppard‘s High ‘n’ Dry and also the year I became a big fan boy of Iron Maiden (even to this day, minus the Blaze Bayley years) with Killers… Sure, I’m missing some albums but man I could go on and on. One album that came out when I was entering grade nine (yikes!) was Triumph‘s Allied Forces. I mean great marketing move geared to us young rockers. Think about it! Black album cover with a blue and gold Flying V on the cover. Let’s see that means one thing to me — lots of guitar! 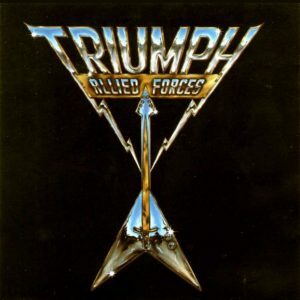 I knew of Triumph as they played in Thunder Bay [Ontario, Canada] in 1980, which was the last time they were here. But now, it was 1981 and there was tons of great music out. I remember seeing this at the record shop and once I flipped it over and saw the song titles, I had to get it and all these years later, I still say it’s their best work — front to back no filler…..
Let’s see what Gil Moore, Rik Emmett and Mike Levine have spinning in the “Rock N Roll Machine”…. “Allied Forces” — Rock troops are on the move… Gil and the boys are gonna save our asses! This is a tour de force and check out Rik taking his guitar playing into the next stratosphere. This song just smokes. Sure the lyrics might be a little fruit loopish in 2016 but hey, get behind the Triumph tank as they will blast their way out of danger! “Fight The Good Fight” — Rik starts off side two with a pretty cool track and for all of you that follow Triumph, if you had to throw down a top 10 Triumph list, I betcha 98% of you’s would have this track on it. Once again, the song builds up and Rik just takes it over in the guitar hero department. “Ordinary Man” — Is Rush hanging out with Triumph? This is concept Triumph — well to my ears anyways… It’s Rik singing and telling us just cause Triumph and the rock troops destroyed your village! We are still ordinary men. “Petite Étude” — Rik shows us his diversity as a guitar hero. Holy crap! The dude can play all styles. “Say Goodbye” — Adios everyone. Some pretty cool Hammond organ during the chorus and Rik, Gil and Mike finish off the album in style… Say goodbye… Take a bow Triumph! You earned it!